Co-Flex Med Elastic Bandage: This Self-Adherent, Hand Tear Wrap, Which Contains Latex, Acts As A Secondary Dressing Without The Need For Clips Or Tape. 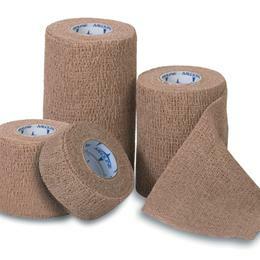 Each Beige Bandage Is Individually Wrapped. Bandage Measurements Are For Stretched Length. Sterile, Latex ' 4" X 5 Yd.